There has been much focus on the Significant Investor Visa (SIV) program which was introduced in November 2012 to encourage wealthy individuals to move to Australia and gain permanent residency through investing $5M in complying investments. The investment criteria have been updated from 1 July, 2015 to include assets that more closely align with the government’s agenda to add to Australia’s economic prosperity, in particular innovation. Many are not aware that whilst there is now a mandatory requirement for SIV applicants to put $500,000 into venture capital funds registered with AusIndusry, entrepreneurs interested in becoming involved in Australian businesses are currently able to invest in venture capital funds under the subclass 132 Visa. • The 132A visa is for those with a significant business history and requires $1.5M to establish a business in Australia (without necessarily involving a venture capital firm) where the applicant takes an active role in management of the company. • The 132B visa requires entrepreneurs to become involved in an Australian business and receive an investment of at least $1M from an Australian venture capital firm registered with the Australian Venture Capital Association (AVCAL). Currently, it is permissible for the entrepreneur to invest with the venture capital firm providing the investment. The 132B venture capital entrepreneur stream has until recently not had much attention, with only a small number of applicants in states such as Western Australia, South Australia and the ACT, versus the business 132A business stream. The benefit of the 132 pathway is immediate residency, which is reviewed after two years to ensure the applicant is meeting the requirements. Having immediate permanent residency grants access to the public healthcare benefit in Australia, as well the freedom of making real estate purchases without being regulated by the Foreign Investment Review Board (FIRB). 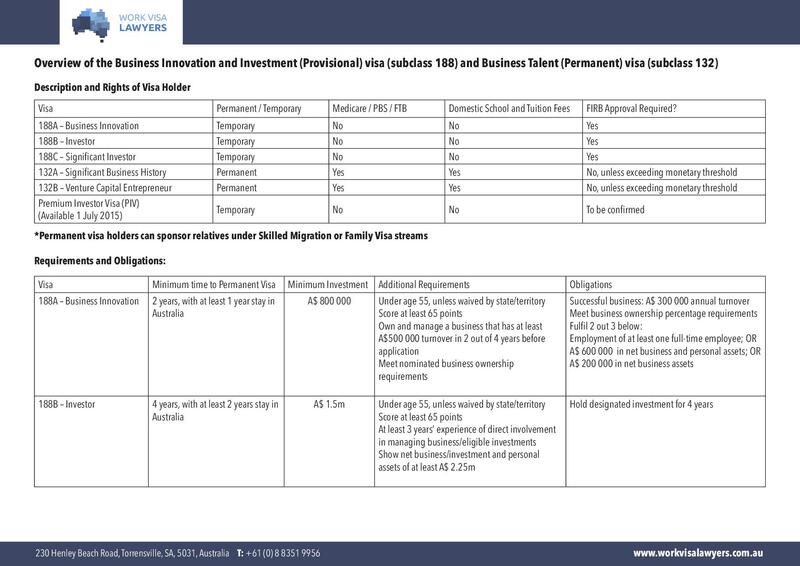 The new Premium Investor Visa, which is by invitation only, requires a $15M investment and provides residency after 12 months, while the SIV is a minimum 4 year temporary residency before permanent residency is granted. For those that are looking to make the move more quickly, a 132B may be more attractive. However many applicants are comfortable with the longer time-frame to plan the tax impact on transitioning their business and other financial assets to the Australian tax regime. Migration firm, Work Visa Lawyers have produced some useful tables on the different types of business and investment visas which can be accessed accessible here and here. It is essential that intending migrants obtain advice on the most suitable option to suit their personal and family circumstances, financial and business objectives. Interested applicants should consult with a Registered Migration Agent in Australia before making a decision on applying for an Australian business or investment visa. Note: the 132B visa sub-class is under review by the Department of Immigration and Border Protection (DIBP) and are not currently accepting state nominations. We understand the internal review is expected to be completed in the next four weeks. For more information our please feel free to contact Chris Johnson or Sean Choong from Work Visa Lawyers, or a migration agent from our Expat Advisors Community professional network.